The Union Station Foundation to Host Ninth Annual Ogden Arts Festival Ogden, Utah - On June 8 and 9, 2012, visual, performing and culinary artists will descend on Ogden’s Historic 25th Street and Union Station for the ninth annual Ogden Arts Festival (www.ogdenartsfestival.com). 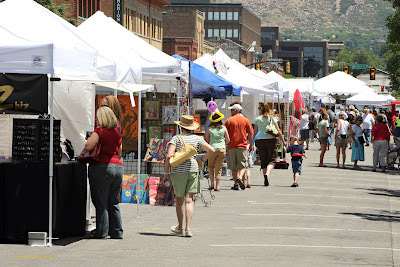 Northern Utah’s largest multi-disciplinary event will feature more than 60 regional and local artists with award-winning fine art exhibits, the Foursite Film Festival, hands-on ARTivities for all ages, live musical performances, a plein air competition and silent auction, and the popular “Taste of Downtown” culinary event. The Ogden Arts Festival will kick-off summer, Friday, June 8 at 3 p.m. at Ogden Union Station Fountain Plaza with a Plein Air competition and a public silent auction. In addition, 20 artists will showcase their talents from booths around Fountain Plaza until 9 pm. From 6:30 to 8 p.m. “Taste of Downtown” will offer culinary creations and samplings of downtown Ogden’s finest restaurants including Ravolis Ristorante Italiano, Tona Sushi Bar and Grill, Two Bit Street Cafe, Roosters, Union Grill, MacCool’s Public House, Crowley Gallery and Café and Jasoh!. Tickets are $10 per person. Guests are encouraged to purchase tickets in advance. New this year, the Plein Air Exhibit and Silent Auction will be open to the Taste of Downtown guests in Union Station’s Gallery 51 where these freshly painted images of Ogden will be available for immediate sale or by silent auction. On Saturday, June 9, 2012 from 10 a.m. to 8 p.m., musicians, exhibitors, painters, sculptures and other artists will showcase their talents at Union Station and along Historic 25th Street. Live musical performances, on two stages, acoustic and rock, will fill the air with music. A food court as well as beer and wine garden will be available. Kid’s ARTivities will spark young artist’s creativity on Saturday from 10 a.m. to 6 p.m. on the Union Station north lawn. The ARTivities will provide a variety of free art forms offered by local non-profit organizations. Participating organizations include Weber State University Arts in the Park, Ogden Nature Center, Eccles Community Art Center, Union Station Foundation, George S. Eccles Dinosaur Park and Wildlife Rehabilitation Center of Northern Utah. New this year, Nurture the Creative Mind Foundation will present “Poetic Portraits” on Saturday from 2 to 3 p.m. on the Union Station south lawn. During this event, youth participants will read their poetry while artists actively paint the poet’s portraits, words and expression. Crowd favorites, the Plein Air and Quick Draw competitions, will become major attractions at this year’s Arts Festival. 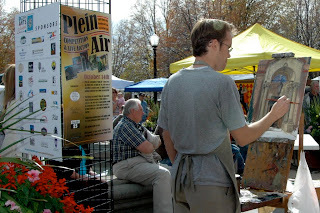 Plein Air competitors will receive a blank canvas on Friday, June 1 with five days to complete their work of art. Finished entries must be returned to Union Station's Gallery 51 by 5 p.m. on Tuesday, June 5, 2012. Boundaries for the Plein Air competition are set to capture the historic and natural beauty of the downtown Ogden area. Completed pieces will be included in the silent auction. Winners of the competition will be awarded cash prizes. Artists interested in participating should visit www.ogdenartsfestival.com or contact Suzy at 801-633-7253. Registration for the Quick Draw competition will begin on Saturday at 9 a.m. Festival goers will be able to watch, as artists paint within the festival and immediate downtown area. Submissions are due by 12:30 p.m. After submitted, the Quick Draw pieces will be on display under the Quick Draw Tent outside on Historic 25th Street and available for immediate sale or silent auction, which will continue until bidding ends on Saturday at 4 p.m.